THE V CHANNEL is a start-up, nonprofit education and entertainment media company. We help parents and teachers inspire kids to be their “Best” by producing virtues-themed coloring pages and videos. Common to people of all cultures, ethnicities and beliefs, virtues are positive character traits that empower young and old alike to flourish as human beings. There are gazillions of coloring pages, but only “V”TOONS Coloring Pages teach kids virtues and inspire them to be their “Best”. “V”TOONS include Disney Characters, Superheroes, Historical Figures, Sports, Dance, Say “NO!” to Bullying and more. Invite your kids to pick their favorite characters. 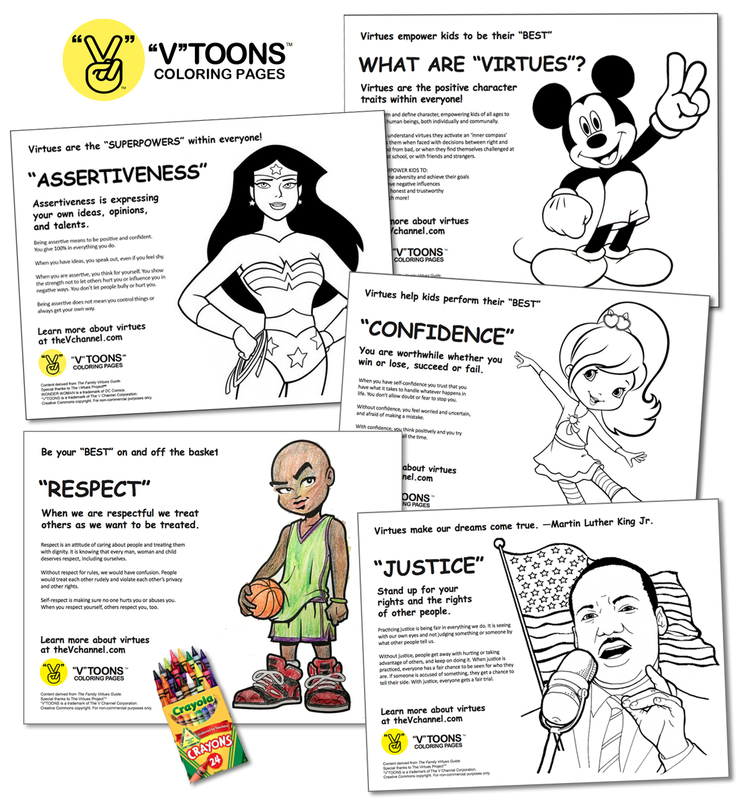 Download and print the “V”TOONS Coloring Pages. Get out the crayons, markers or colored pencils and have fun coloring with your kids while reading about the virtues. Display “V”TOONS where your kids will see them—on bedroom walls, the refrigerator door, or create a gallery in your home or classroom as a daily reminder that virtues empower kids to be their “Best”. The V Channel proposes a Social Good campaign sponsored by Crayola. Crayola can help make the world a better place, one virtue at a time. Featured characters are trademarks of various entertainment and publishing companies. Rights and usage TBD. Creative Commons copyright permits “V”TOONS Coloring Pages to be used for non-commercial purposes. Show us your “Best” artwork. Invite kids of all ages to submit their “Best” virtues-themed drawings and artwork using Crayola crayons, markers or colored pencils. Click play button to watch 1:38 video.